I last did this post back in March 2017 which you can read here. 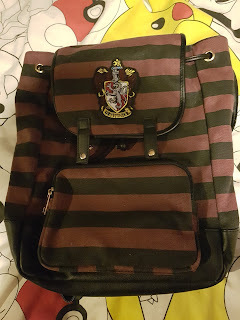 To be honest a few items have stayed the same but as my Harry Potter bag which I got for Christmas has started to be used and is quite a bit smaller than my Batman bag I thought I would give you an update on what I carry around with me. The bag is what my auntie got me for Christmas and is a drawstring backpack. I love this as it is the perfect size for me, it isn't too big and bulky but I can fit in what I need. I also love the fact it is Harry Potter as I am in love with the whole franchise, as most of my Christmas presents showed. In my bag I always have a notepad, this is because I never know when I will get an idea for a post. Plus I much prefer pen and paper over using my phone, I also use this to draft out posts as well as just ideas. I also carry around a diary, again as I prefer pen and paper. This diary is the perfect size for me and one of my presents from my mum, she never fails to get me a good diary especially with the funny sayings on the front. My glasses case always comes out with me as sometimes I just get sick of wearing my glasses. My iPod also comes everywhere with me as I can't stand the music my family listens to in the car so it is my perfect escape. 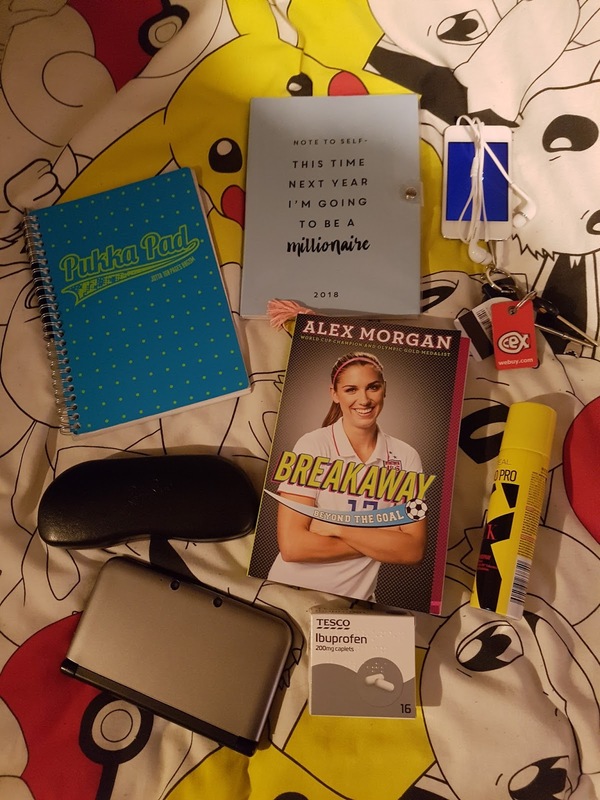 Again I am trying to read more this year ( I said the same last year but this year I will stick to it) so in my bag I currently have my Alex Morgan book. I have a lot of football books to get through this year and this is one of the big ones I have wanted to read. I am hoping having it in my bag will help me read it a lot faster. Also in my bag I have the essentials a pack of tissues, my keys, some ibuprofen just in case and a little can of hairspray for any hair emergencies. My phone and wallet tend to stay in my pockets along with my gloves so they are easily accessible. 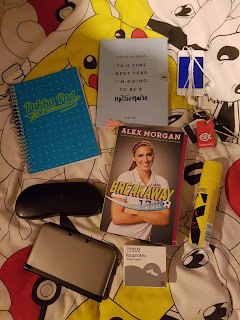 So there you have it that is what is in my bag lately. What do you carry in yours?